Companion Care is a Home Care Company designed expressly to provide affordable, full-time 24 hour non-medical companion care for our clients. Our clients are mainly seniors who are in need of short-term or long-term assistance with their daily living needs or who can no longer function completely alone. We also work alongside hospice nurses for our terminal clients. Our care allows the client to remain in the familiar, comfortable and peaceful surroundings of their own home WHERE IT IS ALWAYS BEST! We serve the following Southern California counties: Los Angeles, Orange, Riverside, San Bernardino, Ventura and San Diego. Call us today at 1-800-562-5994 or contact us online to see how we can make your life or that of a loved one easier, safer and more comfortable! Yes! 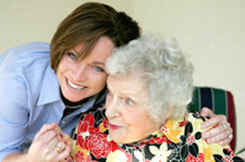 We are a licensed California Home Care Organization.